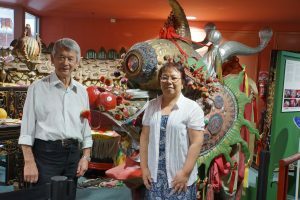 On a hot Sunday in January, I embarked on a road trip to Bendigo to visit the Golden Dragon Museum in Bendigo. 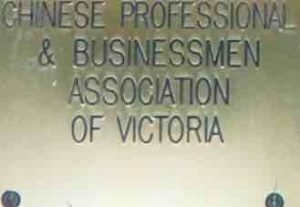 My mission was to seek the plaque that denoted CPBA’s contribution to the museum’s funds. I was met by the museum’s curator, Russell Jack, who showed us around – we felt honoured having our very own private tour of the museum. Russell told me some fascinating stories of how some of the relics and antiques found a home in the museum. This cart was found in an old barn – when the owners of the property sold the property, they contacted the museum to come and take a look at an old wooden cart that had been lying in the barn for years. It is also home to Loong, the first Imperial Dragon and its successor, Sun Loong, 新龙,. Sun Loong takes part in the annual Easter Parade in Bendigo. Sun Loong recently paid a visit to Melbourne and meandered through the streets of Melbourne during the Chinese New Year celebrations of the Year of the Dog. It is hoped that Sun Loong can retire soon. The replacement for Sun Loong is Dai Gum Loong which respects the historical context of Imperial Dragons brought to Bendigo since the 1890s – Dai meaning ‘Big’ and ‘Gum’ meaning Golden. The Chinese name for Bendigo was Dai Gum San meaning Big Gold Mountain. Yes, my mission was accomplished, I saw the plaque which paid for the front doors of the museum. 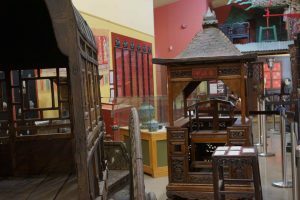 The museum is a fascinating place to explore the history and culture of the Chinese people who immigrated to the region. 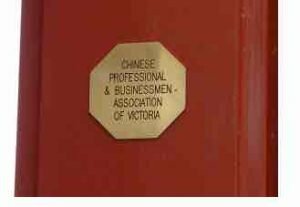 It is built on the historical site of one of Bendigo’s Chinatowns, which also include Chinese Gardens and a temple to Kuan Yin. It makes for a great day out especially at Easter to see Sun Loong’s Easter Parade. Fund raising, by the Bendigo Chinese Association, is underway is for the Dai Gum Loong. You can help here.